Richmond Buildings were off what was then Richmond Street, and is now Richmond Place. We used to play football in the street. We also used to play rounders, kick the bucket, marbles and cards. The old horse-drawn dustmen came, they would go downstairs to pick your dustbin up from your yard outside, empty it in a bin and would even put it back downstairs again. We also had street parties with plenty of food. When we were older we also went down to the beach, if it was warm, at ten o’clock at night. We would collect all the rubbish we could, go into the sea, then set light to the paper and dry ourselves by the fire afterwards. We had fishermen coming through the streets every morning selling fish, ice cream sellers, people with barrows; muffin and crumpet sellers coming round on a Sunday afternoon ringing a bell. On Sunday morning men would come round with a barrow selling winkles. Tamplin’s stables was in Albion Street and they had lovely shire horses. 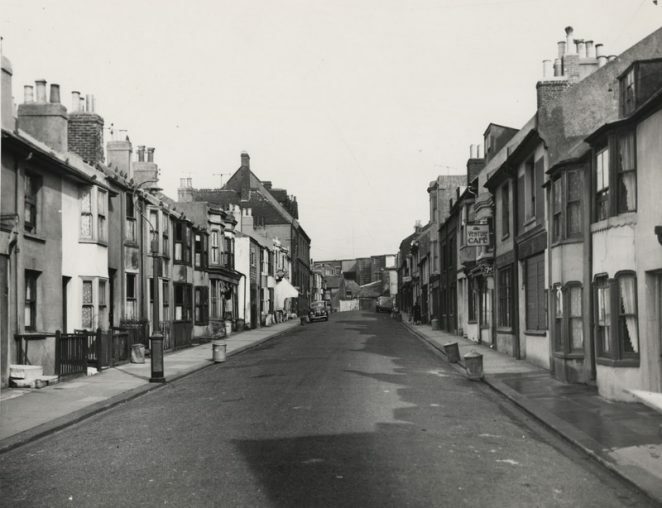 Every street in Brighton had corner shops, and pubs were two a penny. In our area in Richmond Buildings there were at least a dozen public houses. My fa­ther used to have a wireless and our customers used to come into the shop to listen to it in the twenties or thirties. The holiday-makers lodged in the houses around this area and they would come back each year and remember us as newsagents. There was poverty around this area. The houses in Richmond Buildings were habitable, we didn’t have gardens, just backyards which were very small, but at Mr Parr’s we had a greenhouse where we grew tomatoes. The houses were knocked down in 1959 and we moved out in 1958. We knew about it some months beforehand, there was no argument. A lot of people were really unhappy about moving and would have rather have stayed there. The businesses were given some compensation, but not a lot.